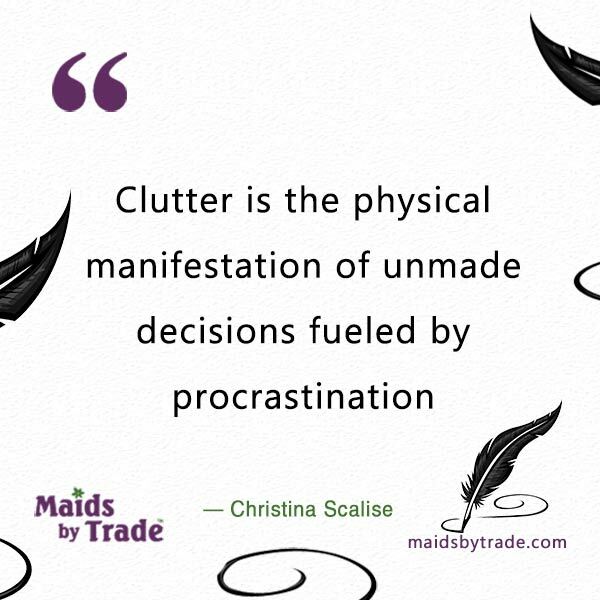 Maids By Trade » Savvy Humor » Got Clutter Issues? Uh oh… Christina just called us out! The chaos and clutter in our homes is because of our bad habits! We probably knew that deep down anyway. Have you ever held on to an item because you couldn’t make up your mind on whether to keep it or throw it away? Two years later that item is collecting dust on a shelf somewhere along with all of the other clutter you’ve held on to. Housecleaning can be a way to purge ourselves of bad habits like procrastination. Getting rid of all of that physical clutter in our homes will actually help purge all of our mental clutter as well! Does clutter affect your life? What can do help solve the problem and prevent stress caused by mess? Feel free to comment quotes, humor or feedback in the section below. Great post about clutter! It’s important to stay organized in our homes to keep the stress down. In addition to our physical clutter, we have the digital clutter too: Tons of digital files and archives in our computers; anything from our pictures to music and the download folder. Fun approach to the subject discussed. Thank you for the “fancy quote”; now I get to share it as an image too. Meanwhile, I found this great post about clutter and organization. Check it out.